That’s when you hit the first growing pains of scaling, both organizationally and technologically. And that’s the stage where many of us don’t know what to do to usher in the next era of our company. “How do you get from one team, where everybody fits around a conference table, to the Amazon-style or Google-sized organization?” asks Randy Shoup, the VP of Engineering at WeWork. Shoup himself has worked as an engineering leader with several companies of various sizes during periods of intense scaling over the last three decades. He was the VP of Engineering at Stitch Fix, Director of Engineering for the Google App Engine, the CTO and cofounder of Shoplilly, and the Chief Engineer at eBay, among other leadership positions. In this exclusive interview, Shoup unpacks several strategies that organizations can undertake as they grow in order to scale efficiently, profitably, and as painlessly as possible. Divide your organization organically into smaller teams. There’s a few ways to handle the inevitable circumstance of teams outgrowing the problems they’re working on (as well as the problems outgrowing the teams working on them), but only one way that both Shoup and the industry at large have found to work well. Shoup calls this a fractal organization. At one level of granularity, you have the big-picture feature or service. At higher levels of magnification, that product subdivides into smaller teams—teams with more targeted focus. Zoom in from there, and you have individuals with an even tighter focus. Teams are like cellular organisms—they need to divide to grow. Whether you’re scaling up from one team to two, or from dozens to hundreds, consider your organization as a microscopic organism. Shoup likes to analogize scaling teams to cellular mitosis. At early-stage startups, everyone works as a single team with a single set of goals. Once the team becomes large enough—say, ten or twelve people—it needs to undergo mitosis. You might split it into the buyer side and the seller side, or the driver side and the rider side. Those teams will continue to grow, and at some point each one must divide again—say, as an example, into the app side and the administrative side. Allow the teams to show you their organic divisions. Rather than stress about how to divide the teams when they grow large enough, you can rely on the teams to show you their natural points to cleave into two or three distinct teams. When a team becomes too unwieldy, that almost by definition shows you that the team needs to be split, and the division will make itself so clear that you don’t need to worry about where to draw the lines. Build cross-functional teams that own their work from end to end. The traditional enterprise software development approach distinguishes product people from engineers, and engineers from quality control, and all of them from customer service. It doesn’t matter who does what, so long as the team has all the right skills. What exact roles belong on each individual team depends on what that team’s goals and purpose are. The roles may be split among distinct individuals, or each person may touch several aspects of that process. The key idea, Shoup says, is that all of the necessary skill sets exist within that team’s boundaries. End-to-end ownership reduces the feedback cycle. The fundamental goal of building teams with complete end-to-end ownership is to reduce the feedback cycle. When you’re not having to communicate between teams to do your primary work, you can have ideas, test them, deploy them, and learn from them in a much tighter cycle. “The way we have as an industry to do that, is by co-locating all those skill sets together in a single team and turning a waterfall pipeline process into a more cross-functional team where everybody’s all working together,” Shoup says. Optimize for providing as much customer value as quickly as possible. The meta-reason for reducing the feedback cycle with single-purpose, full-stack teams is that you are optimizing your organization to provide as much customer value as possible, as quickly as possible. This is where organizational culture comes into play. If an organization is reluctant to divide unwieldy teams, odds are its first-order concern is not producing the most customer value in the least amount of time. Ditto for organizations that spend undue time building foundations without releasing and iterating on its work. Aim for releasing the minimum viable product. To scale your teams and technology successfully, you need a culture built on the three legs of minimum viable products. You need a product to release; the product needs to be viable; and you should release it when it has the minimum necessary to actually be viable. By focusing your culture around getting customers value quickly, you release products that may not be perfect—but that’s the only way you get valuable input from your existing customers. Shoup sees successful cultures building their teams around these feedback loops, so that they can respond to feedback efficiently and productively. He references the old idea that if you’re not a little embarrassed by your release, you waited too long to release it. You can problem-solve only so much in the safety of development; however, if you release your work into the wild, you can iterate to the solution much more quickly (and therefore create more value) because you’re getting valuable responses from actual users. Build around the problems you’re trying to solve. If you’re in fact building teams to own a single feature end-to-end, and that team is equipped to address customer input efficiently, then odds are you’re already building your teams around the problems they’re trying to solve. But it’s still worth delving into what those problems really are. Sometimes, Shoup says, your first-order problems aren’t your real rooted issues. And a lot of deep-seated problems are products of having silos instead of truly cross-functional teams. Subdivide according to the organization you want to create. Instead of growing larger sub-organizations to handle each growing facet of a business, Shoup reminds us to keep subdividing the problems in such a way so that each problem is roughly team-sized. In so doing, Shoup reforms the organization while invoking Conway’s Law: that the products organizations develop reflect those organizations’ communication structures. Utilize managers to make their teams as productive as possible. In a healthy, generative organization, an engineering manager’s job is to remove road blocks from their engineers and team members. That’s essentially it, Shoup says. Shoup stresses that managers aren’t there to tell their teams what to do. They are there to enable the team members to do what they already know how to do. Incorporate product managers into the team. In addition to engineering managers in Shoup’s model, teams also contain a dedicated product management role. And unlike a people manager, which is pretty much always a single person, he has seen a couple different ways to make product management work well. Which way work better depends on how each particular team or organization is constructed. Shoup would not claim that one approach is better than the other. Make the shift from monolith to microservices—but only if you need to. As your organization and your technology scale, you’ll start to suspect that you need to shift from a monolith to microservices. 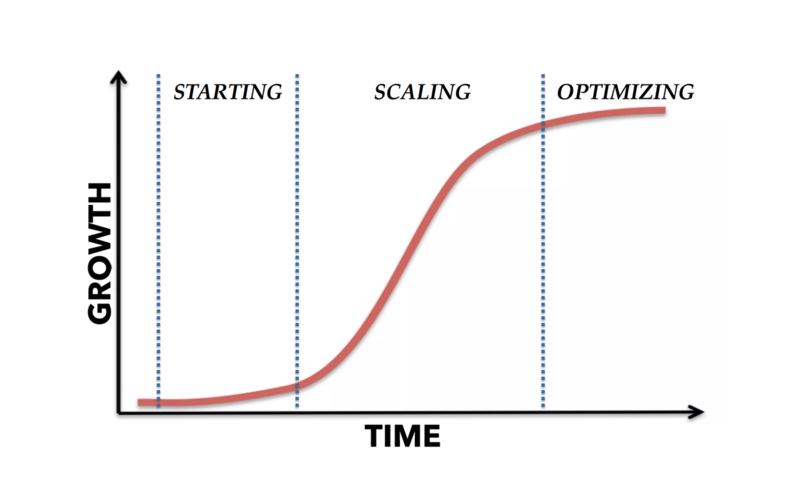 He uses an S-curve diagram to demonstrate these general phases of a scaling organization: starting phase, scaling phase, optimizing phase. Every startup starts out pretty small, with a few initial customers and slight growth. Then at some point, the successful companies hit a scaling phase where customers come rapidly. After that, you’ll often see the optimizing phase—the top part of the S-curve, where it flattens out and growth is slower. Look for warning signs that your monolith is running out of gas. At some point, a startup may scale enough that it outgrows its monolith. Either it’s experiencing feature velocity and its teams are unable to make forward progress from stepping on each other’s toes, or its monolith doesn’t physically scale from a perspective of load or latency. Customer growth might grow so much, what Shoup calls “load-related scaling,” that the monolith can’t handle it. Perhaps you need to be able to load different parts of the system independently of others, or you want different parts of the system to evolve at difference rates. Really, only once you start experiencing these needs do you want to break the monolith into smaller pieces. Have open, mature conversations about everything. The recurring theme in our interview with Shoup is that having open, up front, and overt conversations is massively helpful to scaling both organizations and technology. “I could not agree more that in these healthy, generative organizations, the ability to have these conversations transparently and maturely is a key aspect,” he says. Build cross-functional teams with end-to-end ownership. Optimize for providing customer value as quickly as possible. Build your architecture around the problem you’re trying to solve. Transition from a monolith to microservices—only when you need to. Have honest and transparent conversations… even about having honest and transparent conversations. By learning from each of these tactics, you’ll equip your organization to become more nimble as it reaches more customers more efficiently. Your teams will be constructed to learn as they grow, ultimately contributing to a productive and impactful scaling process.